A delicious side with a Middle Eastern flair. 2. In a small roasting pan place red pepper and drizzle with extra virgin olive oil and roast until the wedges are complete. 3. 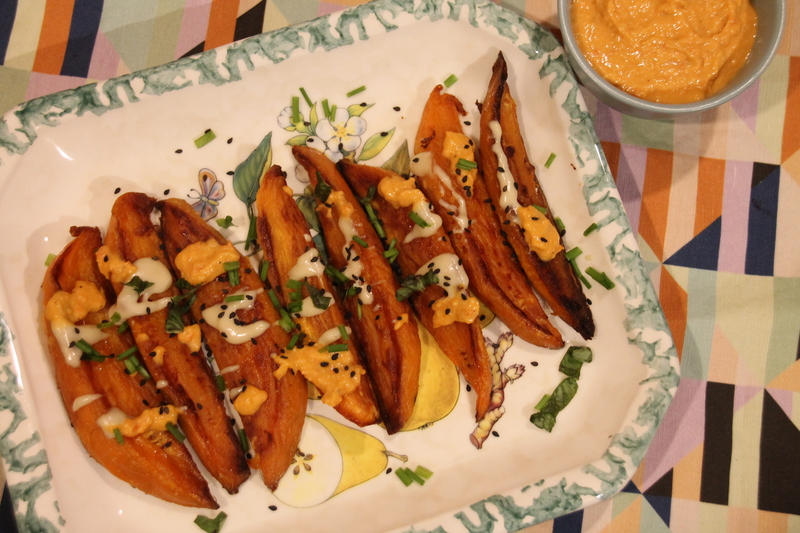 Peel and cut sweet potatoes into wedges. 4. In a medium sized bowl combine extra virgin olive oil and salt with wedges. 5. Place onto another large sized baking sheets and bake for 10 minutes on one side and then turn and continue to bake for another 15 minutes or until brown and creamy in the centre. 6. In a small bowl whisk all the ingredients for the tahini dressing and set aside. 7. Cut red pepper in half and drizzle with extra virgin olive oil. 8. Roast for 1 hour and set aside to cool. 9. Pour chickpeas, garlic, tahini, extra virgin olive oil, salt & pepper in a food processor and blend. 10. Add in the red peppers and blend once again. 11. Once mixture is smooth, set aside in a small bowl. 12. Arrange wedges on a serving platter, drizzle with dressing and hummus and sprinkle with basil, chives, parsley, cumin and black sesame seeds. 13. Serve dressing and hummus on the side. •	Parboil the sweet potato whole first, let cool and then cut into wedges and toss in extra virgin olive oil and then bake is another option, if your like me and don’t enjoy sweet potato wedges cooked only in the oven. •	Add a little water to dressing if too thick. I was making homemade burgers for dinner and wanted to add a different and tasty but familiar side. Well this sweet potato fries made the best accompaniment. I also made some more of my roasted red pepper hummus as a dipping sauce to keep that Middle Eastern theme going. I wasn’t that much of a fan of the tahini dressing, so I added the hummus for my own selfish reasons. Tahini is an odd thing to me; I love it in shawarma; but when I tasted it in this dressing or on its own I just couldn’t get on board. The original recipe called for cilantro, mint and scallions; but I used chives, basil and parsley instead. I also sprinkled in a touch of cumin and I used black sesame seeds as I prefer and always have those in my pantry. I can’t wait to make this again; just without the tahini dressing sadly.